Sudbury, ON - April 25, 2014 - Manitou Gold Inc. (TSX-V: MTU) (“Manitou” or the “Company”) announces the receipt of assay results from the recently completed winter diamond drill program on the Elora Project, located in Northwestern Ontario. The purpose of the program was to test the Jubilee gold zone along a 100 metre long portion down to a vertical depth of approximately 75 metres.Â� A total of 18 diamond drill holes (average length of 64 metres) were completed on this zone. The Jubilee gold zone is a continuous shear structure comprised of sericite carbonate schist, quartz veins, and sheared sulphidic metasediments. Highlights of the program include diamond drill hole E-14-64 which intersected 5.6 g/t Au over a core length of 8.0 metres at a vertical depth of 75 metres.Â� The relatively shallow depth of this particular intersection is supported by a number of surrounding holes completed by the previous property operator, including E-98-07 which intersected 6.4 g/t Au over 11.3 metres (vertical depth of 87 metres), and hole E-98-06 of 3.95 g/t Au over 5.85 metres at a vertical depth of 62 metres.Â� Recently completed diamond drill hole E-14-63 also returned significant gold mineralization at the 65 metre vertical level with assays grading 4.5 g/t Au over a core length of 6.0 metres.Â� This intersection is approximately 15 metres below the previous operator’s hole E-98-09 which graded 4.2 g/t Au over 8.8 metres. Assay highlights from the current drilling program are noted in Table 1 below and a long section of the Jubilee Zone can be found on the Company’s website. 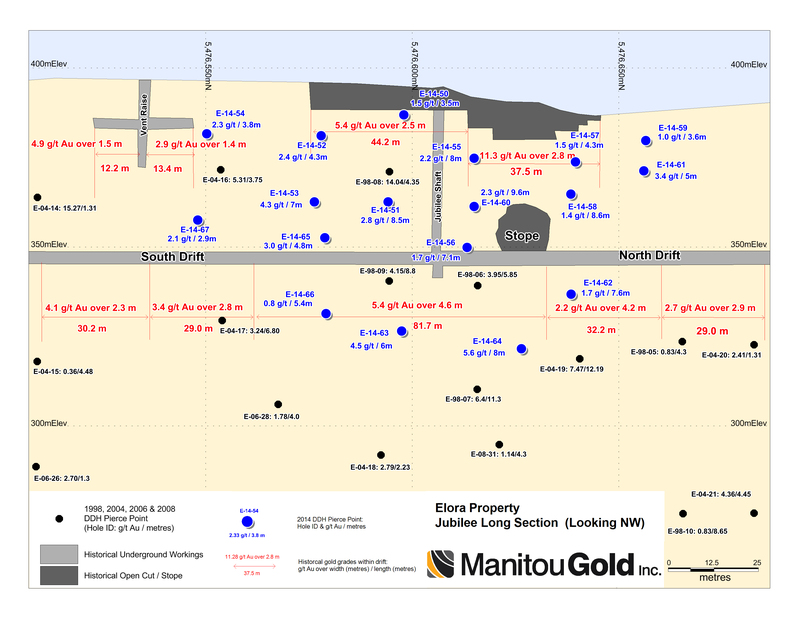 Manitou is a Canadian exploration company with a 150 square kilometre land package of highly prospective gold properties located in the historical Gold Rock District, in Northwestern Ontario.Â� This under-explored area has a very attractive geological setting hosting 61 known gold occurrences including three past producing mines (Big Master, Laurentian and Elora).Â� Until recently, the area has remained relatively untouched by modern-day exploration, pointing to excellent discovery potential over this large land package.